Only a change of dynamic towards diplomacy can offer an alternative to endless conflict in the Middle East. 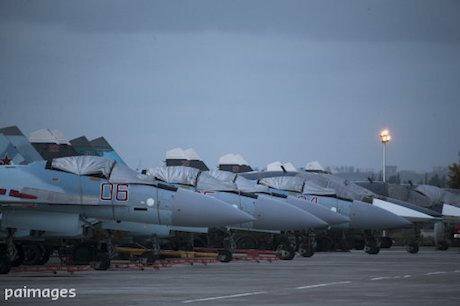 Russian fighter jets and bombers, Hemeimeem air base. Pavel Golovkin/AP/Press Association Images. All rights reserved.In the early weeks of this year, Pentagon sources were reporting that the intense air war against ISIS had killed 30,000 of the movement’s paramilitaries. This military assault, however, had long been factored into ISIS's strategy. As earlier columns in this series have indicated, there is evidence that ISIS planners had already begun to prepare attacks overseas in response to the air campaign. The two major Tunisian attacks on western tourists, and later ones in Brussels, Paris and elsewhere, are part of this longer-term plan. The implication is that ISIS, if suppressed in Iraq and Syria, would be able to respond by morphing into a more traditional insurgency that was still capable of causing continuing and deep insecurity across the Middle East, north Africa, and probably elsewhere (see "ISIS's war: real to virtual, far to near", 4 August 2016). A more recent indication from United States military sources is that the number of ISIS operatives now “taken off” the battlefield has risen to as many as 45,000, though it is unclear if this means deaths, injuries or temporary tactical withdrawals. That leaves ISIS with between 15,000 and 20,000 engaged in combat. Against them, the US is further strengthening its own troop numbers in Iraq, especially to support an Iraqi assault on Mosul, expected to develop in October-November 2016. After more than two years since it exploded onto the scene, there is confidence in Washington that ISIS really is in decline in its core ares. At the same time, the conflict in Syria is continuing to develop. Russia’s involvement has expanded with its use of the Iranian base near Hamadan to conduct raids across northern Syria, while ISIS and other Islamist groups continue to operate against the Bashar al-Assad regime, and the western coalition supports its own allies, including the Kurds. The Tu-22M3 long-range Backfire bombers flown by Russia from Iran can drop a far heavier bomb-load than the smaller strike-aircraft that operate from the main Russian base in Syria. But they mostly use unguided “dumb” bombs, dropped from altitude and thus with very limited accuracy. This is in line with a more general feature of the whole Russian military operation – the level of civilian casualties. It is true that there are uncomfortable questions about the casualties caused by the much large western air war, but independent analysts are in little doubt that the Russian operations are far less discriminate and kill many more civilians (see "Russia in Syria, and a flawed strategy", 1 October 2015)..
Moscow has already achieved its two main aims in the region – ensuring the survival of the Assad regime, and thereby showing that it must be involved in the long-term future of Syria as a major player in the region. In this connection its ability to use Hamadan and cooperate militarily with Iran adds little. But the move does have a longer-term importance, both military and political. It is a substantial undertaking to base a number of long-range strike aircraft in Iran – the Backfires and also some Su-24 tactical bombers. This will most likely involve several hundred airforce personnel with much supporting equipment. It will have been agreed with the Iranians over a number of months and indicates a consolidation of the military relationship that will have an effect across the region, especially in Riyadh. The Saudi authorities have close links with the United States. They are currently implementing a huge arms deal with Washington for advanced F-15SA multi-role aircraft reported to be worth over $29 billion – the largest arms sale of its kind in history. Yet in two ways, Riyadh has grounds for worry over the Russian move. The first is the manner in which Russia is helping to consolidate Assad at a time when western states are clearly far more interested in fighting ISIS than they are in destroying the regime in Damascus. The Saudis even see that Washington and Moscow are coordinating their actions against radical Islamist groups, thus bolstering Assad and weakening his opponents. The second, and even worse, is that the main regional beneficiary will be Saudi Arabia’s long-term rival – Iran. The Saudi nightmare is the emergence of a stable Shi’a "crescent" through Lebanon, Syria, Iraq and Iran, thus stretching from the Mediterranean across to the Arabian Sea. If this is unacceptable in Riyadh, the kingdom also can't do much through its formal political relations with the west to prevent it as long as key western governments regard ISIS as the chief threat. These governments even seem to show little or no concern over the barbarity of the Assad regime, including its use of indiscriminate firepower in Aleppo and elsewhere. Informal and private channels are a very different matter, though. It can be expected that Saudi and other financial resources are being made available to support the armed opposition to Assad and also undermine the Shi’a majority government in Baghdad. One of the complexities of the war in Syria is its double proxy nature – Iran with Russia on one side, and Saudi Arabia and its local allies backed by the west on the other (see "Syria, the proxy war", 14 June 2012). Unless all the parties come together there is little prospect of an end to the conflict. Russian use of an air-base in Iran may have little direct military value but it makes any progress at the diplomatic level even less likely. Until the dynamics change over both Syria and Iraq, "more of the same" is the bleak outlook for people in the region and beyond.